As it turns out, I am even too lazy, and well, I'd like to think practical, to even grate some fresh parmesan this week. I had a tub of grated asiago cheese. That will do, right? I mean, why not use a good tub of ready to use cheese? Chris did get his mozzarella and his request to just make it cheesy. Pound the chicken breasted to about 1/2" thickness. Salt and pepper on both sides. Heat a heavy pan over high heat. Add a little oil and sear both sides of the chicken quickly. Place chicken onto a large plate. Set aside. Turn heat down and deglaze with white wine. Add the chicken stock and bring to a boil. Turn heat off. Mix together the stuffing, thyme, rosemary and sage. Add the stock to the stuffing mixture. Place 2/3 of the stuffing onto a 9" x 14" baking dish. Spread out evenly. Sprinkle with a little bit of asiago, then lay the chicken pieces on top. Spread the remaining stuffing over top, then drizzle with melted butter. Then sprinkle remaining asiago cheese and lay slices of mozzarella cheese on top. Heat oven to 425. Bake chicken for 25-30 minutes. A go to meal! Stella had made the request that she make fresh pasta from the eggs one night. We saved up some eggs and now that we have the week off from school, Stella had time for her home made spaghetti with sausage basil tomato sauce. It is a recipe from this posting. I sat in the office, working, and well, right now, writing this post, leaving Stella with the recipe and her own devices. It was a wonderful afternoon, and a heavenly dinner! Amazing! I am going to push my luck and test your patience with yet another chicken and egg post. Have you had enough with my chicken and egg ramblings? Perhaps some day it will become old news and the novelty will wear off, but for now, we continue to be ever so excited about our chickens and their egg laying. Ruby and Rosie are laying every day. They lay at the exact same time and jockey for position in the nesting area. Although I put in two nesting boxes, they want to lay in the same spot. Rosie, being the bigger chicken, nudges her way in, almost sitting on Ruby, but Ruby does not yield. One way or another, Ruby eventually ekes out a spot next to Rosie. The other day, Ruby laid a prize winning jumbo egg. All I could think was, "that must have hurt." We fried it up the other night when we had Raclette. I ate it atop a piece of crispy brioche with melted raclette cheese and it was fabulous! Bailey, our Americauna, has been very curious. She goes up to check out the area when the other hens are nesting and then goes back up again after they leave. For a couple of days, she sat in the nest for a while and then left, but no egg. But then one morning, an egg appeared. Bailey's egg is quite small and blush in color. She continues to nest, but only one egg so far. Nothing from Ally yet. While the girls were away, Rosie, our Brahma, starting laying eggs as well. Hers are a bit smaller than Ruby's eggs which is surprising given her larger girth. Having learned of this, Maggie made the request for butternut squash ravioli made with fresh pasta. We are getting two eggs a day now and I've been saving them up for tonight's dinner. Slice squash in half length wise and scoop out the seeds. Place flesh side down onto a baking sheet and roast in a 425 oven for 20-25 minutes, until squash is soft enough to mash. Do not overcook, or it will become to mushy. When cool enough to handle, peel the skin off and mash with a potato ricer or masher in a large bowl. Saute pancetta until crispy. Strain fat and add the thyme leaves. Mix together with the squash, asiago, cream, salt, nutmeg and pepper. Chill until ready to use. I put mine into a pastry bag fitted for easier filling distribution. But a good ole spoon works well too. I combined the 7 eggs I had with 3 1/4 cups of "00" flour and 2 tsp of milk. My usual ratio is 2 eggs to 1 cup of flour, but since the eggs were smaller than usual, I used less flour. Knead until the dough is smooth like a baby's bottom. Separate into 2 balls if needed to make it easier to work. Once the dough is smooth, separate into small balls to roll out into sheets. I rolled the pasta to the #4 setting. Pipe the filling onto the pasta sheets with enough spacing to form the ravioli. Cut using a knife, or rolling past cutter. This made about 56 ravioli. Great for freezing, which is what I did with what was not eaten tonight. For the shrimp, simply saute with a little olive oil and a clove of chopped garlic. Pea vines are not really in season, but I got lucky and found some the other day so reasonably priced, and beautiful, I bought a bunch. Trim the tough leaves off. You can tell simply by pinching them. If they break away easily, the shoots are tender. I sauteed a few big handfuls in just a little canola oil and salt over high heat. Saute until just wilted. To serve, boil ravioli in a large pot of salted water for about 3 minutes. Melt 1 stick of butter let simmer until browned. 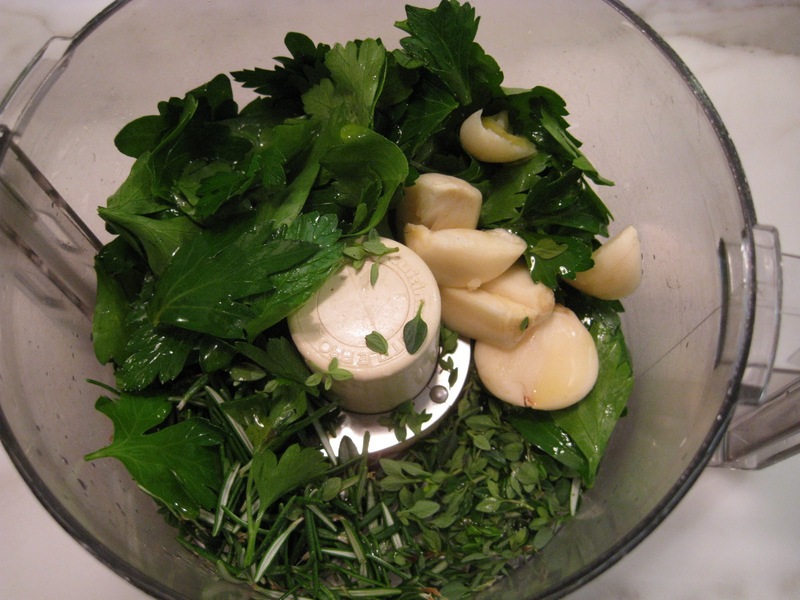 Place a few sage leaves in the butter and let fry quickly while you are browning the butter. Remove the sage leaves after 20-30 seconds and drain on paper a paper towel. Serve ravioli with pea vines and shrimp on top, then drizzle with browned butter and sage. Here's Rosie. She's a little more camera shy than Ruby. With one of my seed orders this past spring, I received a gift with purchase packet of carrot seeds. I sprinkled them haphazardly into my planter bed not really expecting anything to come of them. Here we are in November, and having left them in the dirt for several months, I decided it was time clear out the beds. I pulled about half of them out, gave some to my mom, and with the rest, decided to make a carrot soup. Because of the tight space and not having thinned any out, I had a wide array of shapes and sizes. A soup seemed the way go as it really doesn’t matter what the carrots look like. Cut the carrots into smaller pieces, about 2” long and ½ to 1” thick. Toss with olive oil and salt and pepper. Roast in a 400 degree oven until soft, about 30-35 minutes. Roasting the carrots intensifies their flavor and brings out their natural sweetness. Sauté onions in a large pot with a little olive oil until softened. Add garlic and ginger and sauté until fragrant. Add carrots and continue to sauté for another few minutes. Deglaze pot with the wine. Add in the bay leaf and chicken broth and bring to a boil. Turn heat down, cover and simmer until carrots are very soft, coming apart when pressed with a spoon, about another 10 minutes or so. Remove the bay leaf. Let cool for a bit and then puree in a blender in batches. A lot of blenders will not be safe to use for pureeing hot liquids. It will cause the top to pop off. So, be careful. Some blenders, like mine, have a steam releasing top and so blending hot liquids is okay, but still proceed with caution. You can make the soup up to several days ahead up to this point and refrigerate until ready to use. Return the pureed soup to the pot and add in the half and half. Bring back to a simmer and let simmer, covered, for another 5 minutes. Add some freshly grated nutmeg to finish. Serve with fresh chives sprinkled on top. As per Stella, "Wow, I like this. Now I can see better without having to chomp on hard carrots." We reached another milestone today. The girls have flown off on their own to visit their grandparents. My babies, not so baby anymore. Of course this is not the fist time they have traveled off without us, but sending them off on that plane, all alone, felt different. We are several states and a time zone away from each other. It is another step in the walk of life. One might think Chris and I will party it up for the weekend. This may have been the case several years back, when the kids were younger. But now, I think because I can see the inevitable, rightful progression towards their full independence, I will just miss them instead. We will have a nice dinner out, but I will miss seeing them in their beds at night and just having them around me. Just a quiet dinner for two tonight. Cook the rice with the chicken broth and butter. Simmer, covered, over low heat for about 25-30 minutes or until liquid is evaporated. Saute shallots in a little olive oil. Once softened, add in mushrooms and saute until just cooked. Salt and pepper to taste. Mix mushrooms into the rice, then add in the apples, hazelnuts, and dried currants. Let mixture cool a bit before stuffing into quail. The quail is quite small once deboned. You are likely to find bone in quail in the freezer section, which will work as well. But it is much easier to eat boneless, and if you are in Seattle, you can go to University Seafood and Poultry for boneless quail. Stuff the quail and truss it using kitchen string. I did have a bit of extra stuffing left over which you could reheat and serve on the side as well. Or if you want to make 6 quail, there would probably be enough for that. Place the quail in a non-stick baking sheet. Salt and pepper the quail and brush it with the melted butter. Roast the quail at 450 for about 15-20 minutes, until quail is golden brown on the outside. In a small saucepan, simmer wine until reduced by 2/3. (I burnt my first reduction while practicing guitar. Poor choice of multi tasking just then.) Add broths and boil until reduced by 1/2. Add in pinch of saffron, and stir to incorporate. Slowly add in the butter, 1 tbsp at a time, and stir in until melted before adding the next tbsp. Do not bring the sauce back to a boil, or else the fat will separate. Season with salt and pepper to taste. Pacino was on high alert all afternoon going in and out, seemingly waiting for his girls to come home. How did you eat tonight Mags and Stella? I went to a luncheon earlier this week at Tom Douglas' Palace Ballroom which is what inspired these two dishes. The lunch was served family style and featured what seemed like fall's best. In a large pot, bring chicken broth to a boil. Add in the farro and boil, stirring periodically, for 5 minutes. Turn heat down to low, cover and let simmer for 50-60 minutes until farro is plump and chewy. Drain out excess liquid. Let cool a bit. Leave the skin on and cut the apple into small cubes. Thinly slice the fennel bulb, removing the inner core. Reserve some of the fennel for garnish. Add apples, fennel, thyme, olive oil, balsamic to farro and stir to combine. Season to taste with salt and pepper. Finish with shaved pamagiano. Cut the ends off of the squash, and then cut in half length-wise. Remove the seeds using a spoon to scrape them out and slice the squash into 3/4" thick pieces. Toss the squash with the butter, brown sugar and salt and pepper. Roast in a 425 degree oven until squash is softened and caramelized on the outside. Let cool a bit. Thinly slice endive cross wise . Toss endive with squash. Finish with a sprinkle of the pumpkin seeds. I rarely make dessert, but this one was by request. It's one of the first desserts I ever made and has stayed with me as a no fail, go-to sweet. What I like about it? It's not too sweet, it can be made ahead of time, it's beautiful, and I have been successful every time I made it. Short on measuring, long on delivering. Break Oreos and crush in a food processor fitted with a metal blade. Stir in butter and mix well. Press crust into the bottom and up the sides of a springform pan. Bake at 350 for 10 minutes. Allow to cool. Heat oven to 325, rack set in the middle of the oven. Place white chocolate in a heatproof bowl on top of a pan of simmering water, or use a double boiler. Stir until chocolate is melted and smooth. Remove from heat and whisk in the heavy cream until combined and smooth. Place cream cheese, sugar and egg yolks in a large bowl and beat with an electric mixer on medium speed until smooth. Add in the chocolate mixture and the vanilla and beat until smooth. In a separate bowl, beat egg whites on high until stiff peaks form. Use a rubber spatula and fold in half the egg whites into the cream cheese mixture, being careful not to deflate the egg whites. Then fold in the remaining egg whites in the same manner. Pour filling into the prepared crust. Bake for 50-55 minutes until top rises and is light golden brown. Turn off oven and leave the cake in the oven with the door closed for another hour, or less depending how your oven retains heat. Mine does incredibly well, so I took the cheesecake out at about 45 minutes. In my old oven, I left it for the full hour. Transfer to a rack to cool completely. The cake can be made a day ahead, refrigerated, and then brought out a couple hours before serving to get it to room temp. I prefer my cheesecake to be a little cool, not straight from the fridge, but maybe an hour or so out. Serve the cheesecake with the fresh raspberries on top and raspberry sauce on the side. In a food processor with a metal blade, puree the raspberries with the Grand Marnier and sugar. Remove the seeds using a fine mesh sieve. Refrigerate until ready to use. I feel like there should be confetti and horns blowing, champagne and balloons. Yes! Today we got our first, long awaited, beautiful egg. The road leading up to our first egg could be viewed as, well, a, she's gone around the bend and is completely off her meds, foray into chicken keeping. I admit, I do get a little obsessed. It's been the Swedish Hospital maternity suite of chicken coops. Decorative lights, heat lamps, fresh fluffy bedding every day, meal worms, fresh romaine lettuce, flower and mint plants and sweet talking; those chickens have a pretty good gig going. My latest concern was that the nesting area was not dark enough because of the window in the door that opens to the nesting box. And so today, I bought some taller plants to put in the window box on the door to help block the light. After walking Pacino, I went to plant the new plants and saw Ruby sitting in the nesting box. I quickly scurried away, lest I spooked her into not dropping her egg. I went into my office and tuned into the chick cam. Ruby was turning in circles and then suddenly jumped out of the box. She stood at the door to the outer area of the coop, squawking, almost in complaint. I decided maybe she thought the box was too small and could not get comfortable in it. So, out I went to remove the nesting box, and add more wood shavings for a fluffy nest. Then back into the office I went, chick cam on, plugging along on my work. Ruby scratched and turned and turned in her nest, finally settling down. She sat quietly for about 45 minutes, and then suddenly, I heard a plop. I looked at the chick cam feed and there it was, Ruby's first egg. She stood over it, looking between her legs, pushing it a little with her beak, almost like she was wondering what it was. After a few minutes, she sat on it, and then another 30 minutes, she gathered a few wood shavings around it and left to go about the rest of her day. In this interim, I had a conversation with Chris whereby I professed I could not take the egg from Ruby. How could I take her egg? Let alone eat it? She is sitting on it and caring for it. Chris quickly excused himself from the phone, clearly having more important business to attend to than trying to talk me into stealing Ruby's egg. I left to pick up the girls from school and left the recording of the chick cam going so the girls could see the whole event. When we returned she was back with her flock, egg left safely in the nest. Stella carefully removed the egg and placed it into the carton she had made. Ruby looking at me like "what'd you do with my egg"
We gathered around the counter like we were unveiling an excavated treasure. I cracked the egg open and we all cheered. It was a double yolk. What does that mean, Chris asked. We don't know... but a double yolk sure seems like it should be a sign of good fortune. The yolk was almost bright orange in color. The photos do not do it justice. We agreed on a scrambled egg because it was what everyone would eat. I scrambled it in browned butter and a little salt. Stella said, raising chickens is so exciting! Thank you Ruby for your wonderful egg! It was spectacular!